What do you think of when you hear the word shopping? Do large buildings with a variety of stores pop up? Does your mind conjure up images of markets stuffed with food? Stop a moment. Think of your last shopping experience – at the mall, grocery store, wherever. What did the building look like? Was it closed in with no windows? Probably. Retail spaces are often designed for maximum usage. Walls are used to house shelves or racks for products. Ceilings are chock full of buzzing fluorescent lights. But recent research suggests that this setting is harmful – most stores would benefit from a proper daylighting strategy. At a glance, there are many effects of implementing a proper daylighting strategy in a retail environment. First, it makes for happier employees. We already know form past blogs that proper exposure to daylight allows for increased mood . Happy workers perform up to 12% better than unhappy ones, which reflects well on the store as a whole . It also creates a healthy work environment, as better performance rates lead to better work relationships. 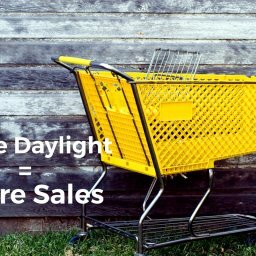 A second benefit of daylighting for retail employees is the balancing of their circadian rhythms. They go to sleep at more appropriate times, get more restful sleep, and wake refreshed. This will also help combat shift work disorder, which is a sleep disorder characterized by lack of sleep, lack of restful sleep, and drowsiness during the day . It is the result of having a changing work schedule that does not allow workers’ bodies to sync with a normal sleep schedule. However, the exposure to natural light would help workers’ circadian rhythms return to a normal cycle . Daylighting also makes for happy customers . Not only are all the products they want still on the shelves, but the employees that assist them during their shopping trip are happier. This makes the customers more comfortable and, as a result, they leave with a more positive outlook in regards to the store. They will return, and likely tell friends and family about their positive experience with that store . Then those new customers go in, have a good experience, and tell theirfriends and family. It is a ripple effect that brings in more customers each day, all because of exposure to natural light and the smiles that natural light puts on faces. So it only stands to reason that daylighting increases sales. Not only are customers more likely to return and spend their money, but the increased visibility allows them to be more sure in the purchases . This cuts down on returned purchases, which allows sales figures to increase. One study even states that stores with sufficient natural light experienced a 40% increase in sales  – an incredible percentage. Stores that utilize daylighting also have a competitive edge – consumers drawn towards green living practices are more likely to shop at a store that values them as well . In addition to this, the building itself benefits. According to Design Services Group, 10% of a retailer’s construction budget is spent on lighting . That’s a lot of money that could be put to better use. The implementation of daylighting strategies would not only cut that percentage, but it would also cut electric bills and HVAC system usage. This could save retailers thousands of dollars a year. It’s a win-win for companies. But now we have to ask the question…how can a store implement daylighting? Retailers need every ounce of free space for product. They can’t sacrifice wall space for windows. The most documented answer is simple: skylights . Studies suggest that removing sections of annoying, headache-inducing fluorescent light panels and replacing them with skylights would be a cost-effective daylighting strategy. This would allow natural light in without forfeiting any shelf space. Daylighting in retail spaces is an under-utilized element of design. It would provide health benefits to employees and customers. It would also increase sales, allowing stores to flourish. 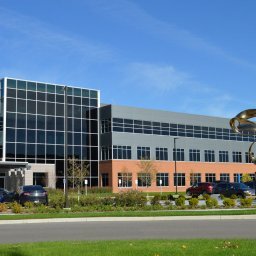 If these facts have piqued your interest, get in touch with Suntuitive Dynamic Glass and learn how to introduce more daylight into your building without introducing a higher heat load, while increasing occupant comfort! Visit www.Suntuitive.com or call 616.662.7216 for more information. It’s open and the ribbon has been cut! 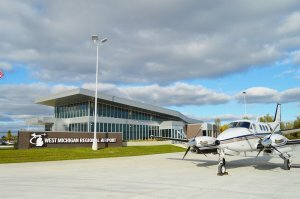 The debut of the newest structure on the grounds of the West Michigan Regional Airport occurred earlier in October. 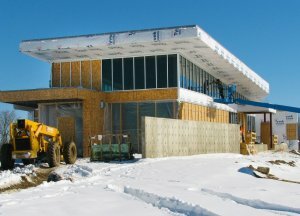 One of the things that make this building significant is its use of Suntuitive Dynamic Glass. 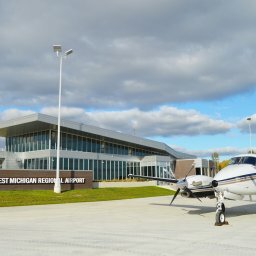 The design of a modern airport is becoming a “must see” attraction and with the added need for an intense security protocol, the amount of time people spend at airports has been growing a great deal. Plus there’s a pride factor, as visitors to a city first encounter the airport and make their initial impression of the community. So having something modern, innovative, and inviting has become more important than ever. In the first part of our series on the effects of daylighting we did a high level overview, but now let’s take it a bit further. Think of your time in school. What did your classrooms look like? If you got your education in the United States, chances are good that your classroom had off-white cement walls, drab carpet, and small (if any) windows. The lights you sat under were probably harsh fluorescent panels. Did those help you concentrate? Probably not. In recent years, more and more people have been pushing for the use of natural light in the classroom – and they’re right to do so. Natural light elevates mood, increases concentration, and can even help raise average grades by up to 25% !